Tolomatic's TKB linear table style actuator is designed for high speed applications with superior flatness and straightness requirements. 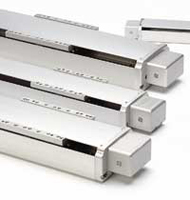 This unique actuator utilizes two parallel profile linear guides with four recirculating ball bearing blocks to provide a wide and stable mounting surface with consistent and precise performance. Customized stroke lengths up to 96 inches are available.